Jess Forster art and design. Sustainable textiles, felt objects and artworks. Up coming Workshops. I wholeheartedly believe in the notion of 'pay it forward'. I fulfil this mantra by sharing my knowledge + passion with others. See below for A CALENDAR OF future Art EXHIBITS, EVENTS + Felting Workshops. In this immersive workshop, learn about the incredible properties of natural fibres and their applications in art making. You will learn the ancient craft of felting to create your own wall hanging using locally sourced fibres techniques. In a 3 hour workshop, participants will learn about the ancient craft of felting whilst creating their own Wall Hanging to take home. Felting is the process of interlocking fibres into a strong fabric through heat, water and agitation. We will also sample various freeform weaving, stitching and pre-felt collage techniques. Come and enjoy a unique, immersive and sustainable process - we even use locally sourced wool! All materials are supplied & light refreshments are provided. In an immersive 3 hour evening workshop, participants will learn about the natural properties of locally sourced sheep wool and it’s creative possibilities - including handmade felt. Jess will explain and demonstrate the various processes and techniques involved with handmade felt. Students will design and create their own project - a unique wall-hanging to take home. This workshop is designed to be hands-on, interactive and collaborative - and above all FUN! I can't wait to share my ideas, skills and knowledge with you! Click the button below to book your spot. Places are limited. $35 per student, all materials + light refreshments included. In a fun, unique, creative workshop, the kiddos will be immersed into the unique art form of felting! Using locally sourced wool, we will create a ‘Felt Nest’ or bowl using wet-felting and ‘resist’ techniques. In a 3 hour workshop, students will learn about the natural properties of locally sourced sheep wool and it’s creative possibilities - including handmade felt. Jess will explain and demonstrate the process and techniques of wet-felting. Students will immerse themselves in their own project, creating a handmade Felt Nest (bowl) to take home! This workshop is designed to be hands-on, interactive and collaborative. All materials will be supplied and light refreshments will also be included. $35 per student. Click the button below to book your spot. Places are limited. In a 3 hour workshop, students will learn about the natural properties of locally sourced sheep wool and it’s creative possibilities - including handmade felt. Jess will explain and demonstrate the process and techniques of wet-felting and free-form weaving. Students will immerse themselves in their own project, creating a handmade wall-hanging to take home. In a 3 hour workshop, students will utilise a range of mediums to create a unique artwork of their own. Students will be immersed in the playful use of inks, charcoal, paint and paper, whilst learning contemporary art techniques and skills. All materials + light refreshments provided. $35 per student, all materials supplied + light refreshments included. Why not try a unique school holiday activity where kiddos can get hands on + creative whilst learning new skills. Each student will learn about fibres such as sheep wool, where they come from, why they are important to our everyday lives and how we can utilise them to create artworks. Students will learn simple weaving and felting techniques to create a unique wall-hanging. The workshop is designed as a step-by-step, which means I will demonstrate each stage, then students will attempt. This makes it achievable, fun and suitable for ages between 6 and 15 years. Hen's Teeth Trading, Cobram, Victoria. In a 2.5 hour workshop, students will utilise a range of mediums to create a unique artwork of their own. Students will be immersed in the playful use of inks, charcoal, paint and paper, whilst learning contemporary art techniques and skills. $95 All materials + light refreshments included. In a full day workshop, participants will learn about the natural properties of locally sourced sheep wool and it’s creative possibilities - including handmade felt. Jess will explain and demonstrate the process of felt making, leading each participant through two unique projects. The first project utilises various felting techniques such as wet-felting, using pre-felts, cutting and stitching to create a triptych artwork. Students will then apply their new skills, fuelled by creative inspiration, to create their second project – a felt wall-hanging for their very own wall. This workshop is designed to be hands-on, interactive and collaborative. All materials will be supplied and light refreshments will also be included. Please bring your own lunch, or a small plate to share. In a three hour immersive workshop, learn about the ancient and ethical craft of felting wool. You will create your own ‘Felt Nest’ or bowl using locally sourced sheep wool and natural fibres. In a half-day workshop, participants will learn about the natural properties of locally sourced sheep wool and it’s creative possibilities - including handmade felt. Jess will explain and demonstrate the process and techniques of wet-felting. Students will immerse themselves in their own project, creating a handmade wall-hanging to take home. 10am - 1pm, $55 per person, all materials + light refreshments included. In a half-day workshop, participants will be immersed into the unique art form of felting, its cultural connections and its creative applications. Using locally sourced wool, we will create a ‘Felt Nest’ or bowl using wet-felting and ‘resist’ techniques. All materials will be supplied and light refreshments are included. Click below to book your spot. In a hands-on 2.5 hour workshop, students will learn about the incredible properties of wool, where it comes from and how we can transform it into special objects to keep. Students will create a felt nest or bowl using locally sourced wool. All materials included. Light refreshments provided. In a hands-on 2.5 hour workshop, students will learn about the incredible properties of wool, where it comes from and how we can transform it into special objects to keep. Students will create a felted wall-hanging using locally sourced wool. In conjunction to Jess Forster's solo exhibition at the Corner Store Gallery in Orange NSW, she is also teaching a series of felting workshops to share her knowledge and creativity with the local community. Hosted at the Corner Store Gallery, 382 Summer Street Orange NSW. THURSDAY 29th March, 10am - 12.30pm. $45 per person. Limited to 12 people per class. All materials included. Light refreshments included. In a fun, hands-on creative workshop, participants will learn about the ancient craft of felting. Using locally sourced wool and other natural fibres, we will create our own 'Felt Nest' or bowl to take home. All materials supplied, light refreshments provided. 'Felt Nest Workshop' - ORANGE NSW. Tuesday 27th March 6pm. In conjunction to Jess Forster's solo exhibition 'Dust + Gums' at the Corner Store Gallery in Orange NSW, she is also teaching a series of felting workshops to share her knowledge and creativity with the local community. 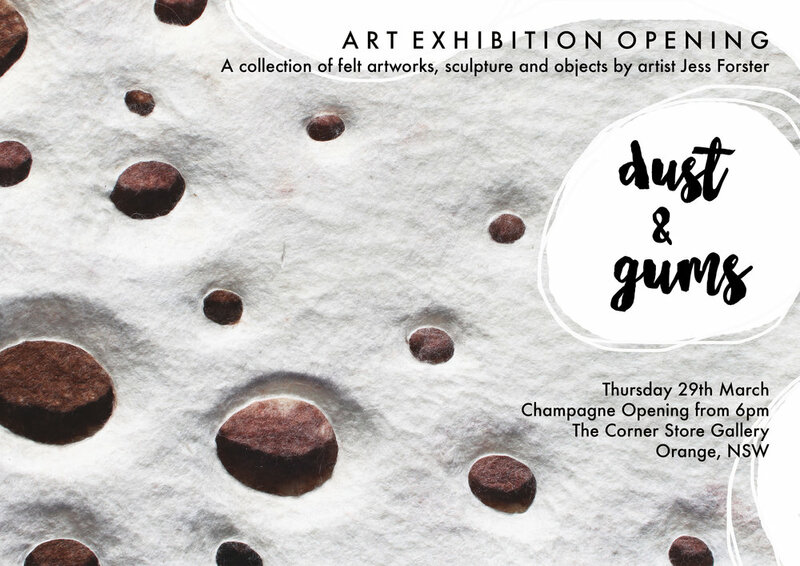 Hosted at the Corner Store Gallery, 382 Summer Street Orange NSW. Tuesday 27th March, 6pm - 8.30pm. $45 per person. Limited to 12 people per class. All materials included. Light refreshments included. Artists on Parade, Tumbarumba, presents the solo show of Fibre Artist Jess Forster - 'Nesting'. The exhibition is a collection of Jess' latest body of felted artworks, sculptures and objects, exploring local natural environments and forms. Eastern Riverina Arts will be hosting a FELT NEST Workshop on Saturday 17th February in conjunction with my work being the current 'Window Gallery' Feature Artist this month. The workshop will explore the incredible properties of wool and the ancient craft of felting. Participants will learn to create their own 'felt nest'. To register, use the 'Contact Me' page or email jforsterdesign@gmail.com to ensure your place. Spots are limited! Cost: $40 per person, pay on the day. Jess Forster will be selling unique, handmade felt artworks and objects at the River and Wren Boutique Markets, Wagga Wagga NSW. Learn about wool and its fascinating properties, where it comes from and how to make your own felt. In a hands-on experience, participants will learn how to create their very own felt 'nest' to take home. All materials are supplied and are locally + ethically sourced. In a half-day workshop, kids will learn about wool and its fascinating properties, where it comes from and how to make their own felt. In a hands-on experience, participants will learn how to create their very own felt 'nest' to take home. All materials are supplied and are locally + sustainably sourced. In a half-day workshop, big kids will learn about wool and its fascinating properties, where it comes from and how to make their own felt. In a hands-on experience, participants will learn how to create their very own felt 'nest' to take home. All materials are supplied and are locally + sustainably sourced.